It is almost Eid and I am pleased to introduce another friend of mine who is here to share a quick and easy dessert recipe with us today. I met Sayana Rahiman of My Mouth Is Full at a book club years ago and then we met again, virtually, at Fooderati Arabia - a food blogging community. We have been in touch via Instagram and I absolutely love her food photography. I am passing on the mic to her and let her do the talking from here. I don’t remember eating any form of rice pudding in my childhood. Perhaps it is because Payasam is the default dessert in Kerala. I was never a Payasam eating kutti. In fact, I still don’t fancy it. It is quite labor intensive for what I would decribe as a plain dessert. Coconut milk was the base ingredient and it is a daunting task to freshly squeeze it from grated pulp especially if you have a house full of guests. At those umpteen family gatherings, particularly on Eid, my heart would sink when I would see that large tray crammed with styrofoam cups teemed with Jaggery hued Payasam which would mostly be Ada Pradhaman, which is made from ground rice flattened to flakes. Silent screams would resonate in all corners of my mind if I saw Cherupayar Payasam made from split green gram or Moong Dal. Didn’t we eat enough lentils already that we had to make a dessert version of it? That was until I had Priya Aunty’s Pal Payasam. Priya Aunty is my Umma’s first and oldest friend she made when she made UAE her home. Hailing from Kannur where the food is very different from the cooking style in Thrissur, the food she has served many a time has left wonderful memories. I remember being handed a delicate dessert bowl made of glass and a tiny spoon. My 12 year old self intrigued at the flecks of rice started tucking into this creamy, pure white concoction, oblivious to my surroundings. I looked up only when I was finished to find her smiling quickly whisking away my bowl for seconds before I could ask her. Truly the woman I called Amma, my first word too, knew my heart too well. 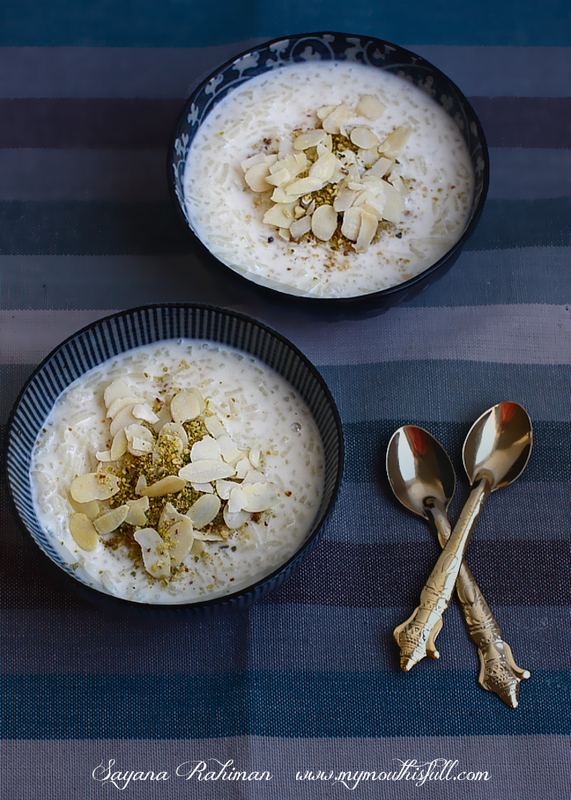 You could say the recipe I am sharing today is a version of Pal Payasam. That’s the memory that struck when I first made this pudding. The addition of white chocolate makes it rich yet it has a surprisingly light texture. I love how it thickens a couple of hours after chilling making it the perfect post Taraweeh dessert. Top it off with Almond flakes and Pistachio dust for some crunch. Don’t be surprised to be scooping just one more spoon, for the third time, into your empty bowl. In a large non¬stick saucepan, place all the milk, rice and sugar. Bring it to a gentle boil and then turn it down to a simmer for 20 to 30 minutes. Keep stirring occasionally to make sure the rice doesn't stick and eventually burn at the bottom. Check the rice is cooked through. It will be soft and plump. Take the pudding off the heat and stir in ground cardamom and mix well. 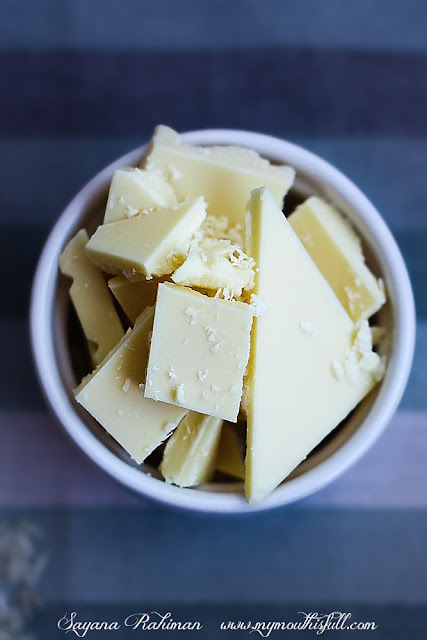 Add chopped white chocolate and stir until the chocolate is completely melted. If chilling, make sure the pudding has cooled down completely before placing it in the refrigerator. Top with nuts right before serving. Note: Unless you don’t mind a very thick texture, avoid chilling the rice pudding for more than two hours. 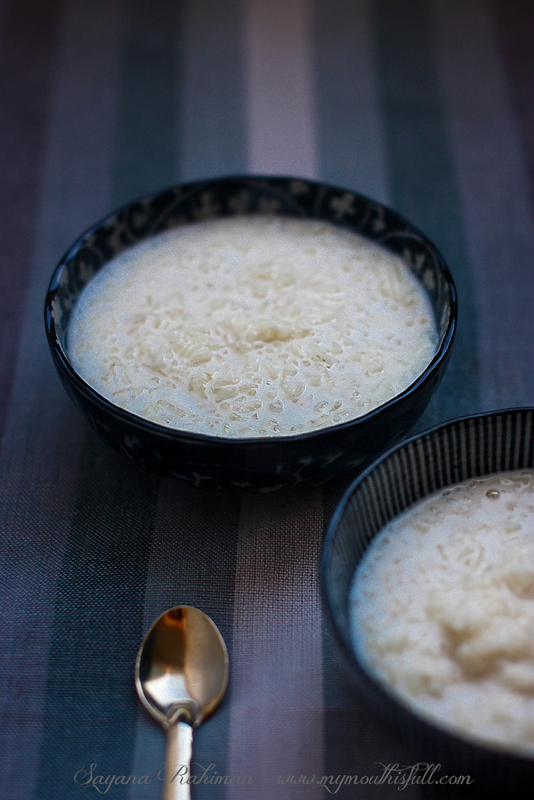 Rice pudding is a favorite dessert of mine. Infact, I have requested my mother to make her rice and almond pudding this Eid and I cannot wait to taste it. I never thought of adding white chocolate to our rice pudding. I will definitely be trying this out. Thank you so much Sayana for your recipe and gorgeous photos! Thank you so much for sharing this recipe , nice recipe , the was you explain was well understood and i have see many recipe in your site all very useful please keep blogging and the make site more helpful.Custom essay writing service site able to provide you with the writing help you have been looking for also get result in any time. This article has every last moment points of interest which are clarified understandingly.I found your site as a perfect platform to get good contents to read.